By 7 Worlds Collide. Sony. New Zealand singer/songwriter, Neil Finn, Crowded House's frontman, has collected musicians, singer/songwriters and bands from all across the globe -- for the second time. Finn's new 7 Worlds Collide project brings alum members from his first effort -- including his brother Tim Finn (Split Enz), Radiohead's Ed O'Brien and Phil Selway, guitarist Johnny Marr and singer/songwriter Lisa Germano -- while enlisting members from Wilco, Scottish singer/songwriter KT Tunstall and New Zealand pop star Bic Runga. The result, The Sun Came Out, is an excellent double-disc of pop gems with numerous surprises. As a benefit for the non-profit organization Oxfam, The Sun Came Out reflects Neil Finn's brighter, pop sensibilities (in his solo work and with Crowded House) and, as the title indicates, acts as a polar opposite to the tone set in Dark Was the Night. Though there are strong offerings by veterans like Finn, Jeff Tweedy (whose "You Never Know" was likely an earlier blueprint to the version released on the latest Wilco) and Johnny Marr, the best songs come from the unlikely cast of longtime "support" musicians. Radiohead drummer and percussionist Phil Selway turns in a stirring classic blend of British folk and Middle Eastern influences with the austere "The Ties That Binds Us." John Stirratt, Wilco's unheralded bassist and vocalist, delivers a lovely, melancholic self-penned number, "Over and Done," making one wonder why this was not included on the band's recent release. Bic Runga, a huge pop star in New Zealand, collaborates with Scottish singer/songwriter KT Tunstall to create a bare and angelic "Black Silk Ribbon." And both of them turn in strong solo vocal performances (Tunstall with "Hazel Black" and Runga with "A Change of Heart"). LA-based songwriter/instrumentalist Lisa Germano delivers one of the album's highlights, appropriately reprising the song "Reptile" from her 1998 release, Slide. This new version carries more humility, brightness and a sense of fun. Accompanied by various project band members, their spouses and children (and one pet dog), Germano energetically leads a chorus, "The sun came out/ and it didn't go away/ No, it didn't/ it didn't go away," that unexpectedly captures a fun, yet dark, humor. Also, Germano's string work provides an additional depth to a number of songs on this collection, namely to Neil's son, Elroy Finn, whose tragic tale "The Cobbler" is a spare, nearly perfect story sung with subtle pop touches and a haunting underpinning. 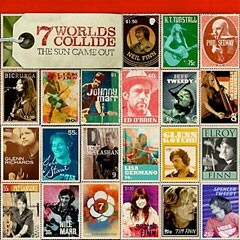 Under the production of Neil Finn and Jim Scott, the new 7 Worlds Collide release of The Sun Came Out contains two CD's worth of pop nuggets, providing that last musical blast of summer before it surrenders to autumn.